But how? Two new studies suggest that an incredibly important mechanism by which Democrats and Republicans shift the distribution of income is the tax system. The first study, from political scientists Christopher Faricy and Christopher Ellis, examines how individuals perceive the same social spending that occurs through direct spending and through a tax expenditure. They find that support for spending is higher when the spending is spent through tax expenditures rather than directly spending the money. The authors also find that when the public is aware of distributive effects of tax benefits, it shifts support. For instance, when the public is made aware of how the retirement income deduction and mortgage interest deduction benefit the rich, that pulls down support for the programs. 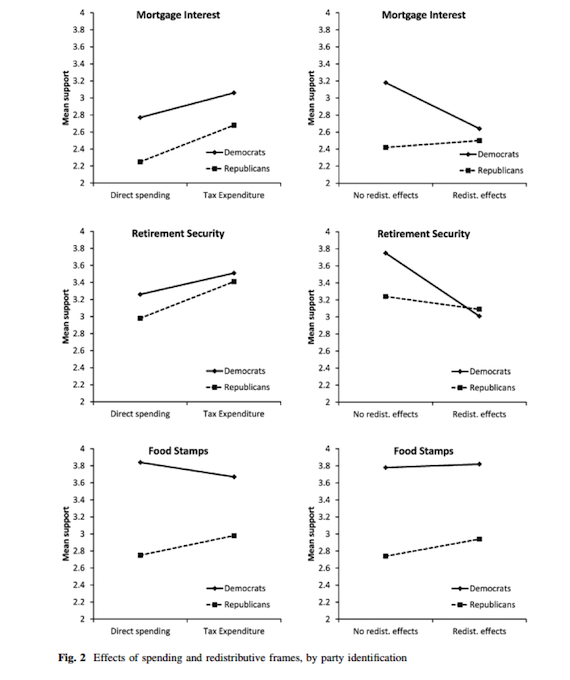 Of course, these effects were mediated by partisanship: Republicans were more concerned to whether the spending was direct or through the tax system, while Democrats were more sensitive to the distributional effects. These results suggest why programs like the Earned Income Tax Credit can attract bipartisan support: Conservatives like that it’s a tax credit, while progressives like its redistributive effect. Economists, meanwhile, like that it’s a direct income support for low and moderate income families. And centrist wonks like that it’s tied to work, and that it’s not the minimum wage. It’s likely that progressives can leverage this effect to get more redistribution: Highlight the injustice of tax cuts for the rich, but press for more expenditures for low-income people. The second study, by Faricy alone, examines how exactly the partisan politics of the tax code play out. Faricy, who is an assistant professor of political science and public policy at the Maxwell School of Citizenship and Public Affairs at Syracuse University, has just written a new book, "Welfare for the Wealthy," examining how the policies of different parties affect inequality. In the paper on tax policy, he examines tax credits (overwhelmingly benefitting the poor) and tax deductions (overwhelmingly benefitting the rich) and looks at how the partisan control of the federal government shifts these benefits. 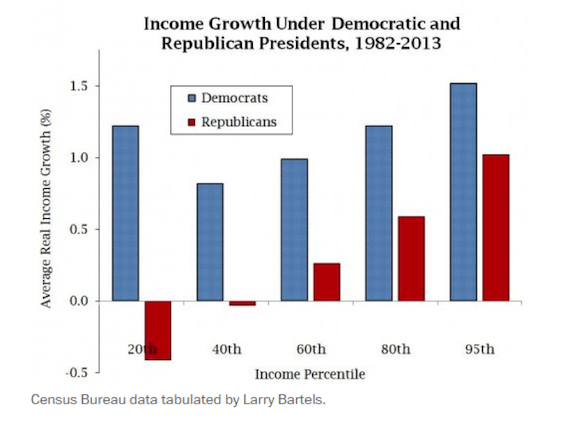 In previous pieces, I’ve examined the evidence that Democrats boost the incomes of working-class and middle-class Americans more than Republicans and also do a far better job of ensuring equitable growth across racial groups. I’ve also explored reasons for this, and particularly reasons that pundits struggle to see these effects. First, Democrats preside over lower unemployment rates and a stronger economy, which strengthens workers’ bargaining power. Second, market conditioning (like regulation) shapes the income distribution. Third, Democrats pursue a more active fiscal and monetary policy, whilst Republicans are more worried about higher inflation. Finally, there are clear effects from policies that empower labor and policies, like the minimum wage, that directly benefit workers. However, research shows that Democrats (and left parties in general) are increasingly struggle to redistribute income downwards. Some of these reasons are unique to the United States. First, the rise of an increasingly powerful donor class and the increasing importance of money in elections has forced Democrats to draw money from individuals and corporate actors deeply skeptical of a robust role of government in public affairs. In addition, business interest groups have become more mobilized. A new study by political scientists Alexander Hertel-Fernandez and Theda Skocpol finds that the increasing mobilization of the small business lobby has pulled Democrats to the right on tax policy. 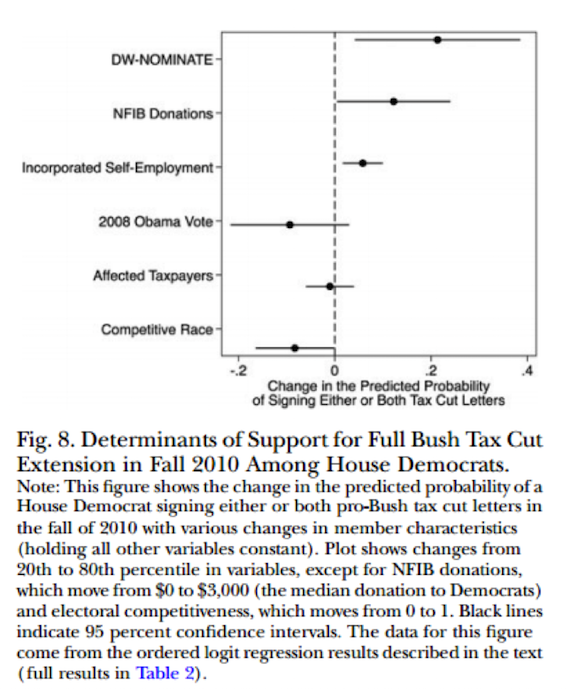 They find that in the 2010 fight over the Bush Tax Cuts, Democrats who received donations from the National Federation Independent Business (NFIB) were more likely to support extending the Bush Tax Cuts, even after controlling for ideology and other factors. What are the main takeaways? First, the tax system is a ripe mechanism for income redistribution, as Republicans appear to be more willing to accept redistribution through credits. As I’ve noted, a key fear is that by obscuring the government’s role in redistribution, it strengthens Republican narratives of self-reliance. Although this is a clear downside of tax credits, given the Republican opposition to direct spending it may be a necessary evil. The second takeaway, and one that cannot be stated frequently enough, is that the mythology that both parties are indistinguishable is entirely wrong. Structural forces shape both parties, but one party actively reinforces class, racial and gender inequality while the other takes steps, however falteringly, towards a more equitable future. That being said, progressives must make efforts to pull both parties in a more economically liberal direction. That entails reducing the power of money in politics and mobilizing the power of voters and other ordinary Americans.